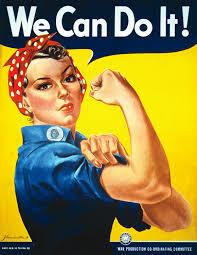 In another of my “famous” themes; Time Loves A Hero, I recently began to wonder about “Rosie the Riveter.” I had read an article about the recent demolition of Boeing’s plant number 2 in Seattle; the site of so many “Rosie The Riveters;” women who built, and assembled military aircraft during World War Two. There’s an iconic photo that I always associated with the “Original Rosie” (photo below). What is also interesting about that building is Boeing covered and painted the roof of the plant to resemble the houses and landscape of the neighborhood so the plant would blend in as camouflage should there ever be an aerial attack at the facility. Back to Rosie; when I went to investigate some information about Rosie, I came to find out the picture I see in my head became more famous from the 1980’s than it was from the 1940’s. “Way back when,” photography was not digitally shot, and categorized. In fact, recently in the news, the man on the cover of Life Magazine who claimed he was the sailor who kissed the nurse in Times Square at the end of WWII recently died. 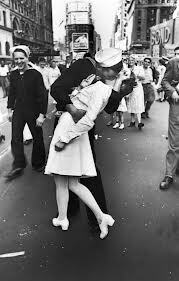 Controversy still hangs around that picture as to the true identity of the sailor in the picture. I thought it was interesting enough to include this paragraph on Rosie that I found on Wikipedia to help keep the record straight. Nice Double D, thanks for the info! SOrry i missed you at the Marathon finish line!